It’s genius! I have no idea why it’s taken me so long to figure this one out, but YUM! I’ve done chocolate chips in my banana muffins before. Chocolate and bananas go way back, right? But adding the cranberries was something new. I had a bunch left over from a spur of impulse buys at my local farmer’s market back in October, and I thought, why not? 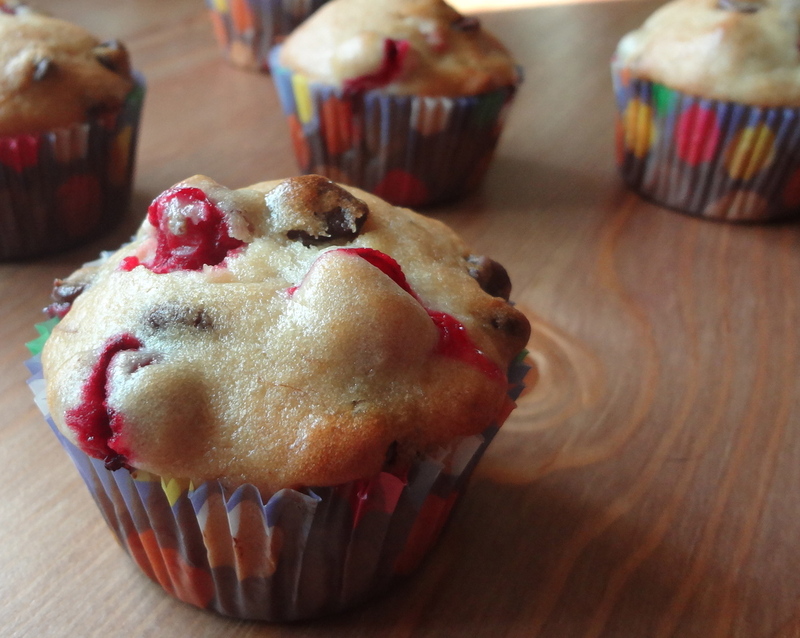 You toss them in frozen, and by the time the muffins are done, they are oozey, squishy, and amazingly tart when pared with the inherent sweetness of both bananas and chocolate. I’m seriously considering applying this flavor combo to other food categories. Ice cream? Cookies? Pancakes? Yes please. 1. Preheat the oven to 350° F. Combine all the dry ingredients in a bowl, and mix well. This helps evenly distribute the salt, baking powder, etc. 2. Mash the bananas in a large mixing bowl. Add the egg and apple sauce, and use an electric mixer to combine. Then add the milk and the oil, and mix it again. 3. Add the dry ingredient mixture to the banana goo (technical term) in small batches, mixing after each addition. Then, fold in the cranberries and chocolate chips until evenly distributed. 4. Line two 12 cup cupcake/muffin tins with paper liners, and fill each cup 2/3 of the way with batter. 5. 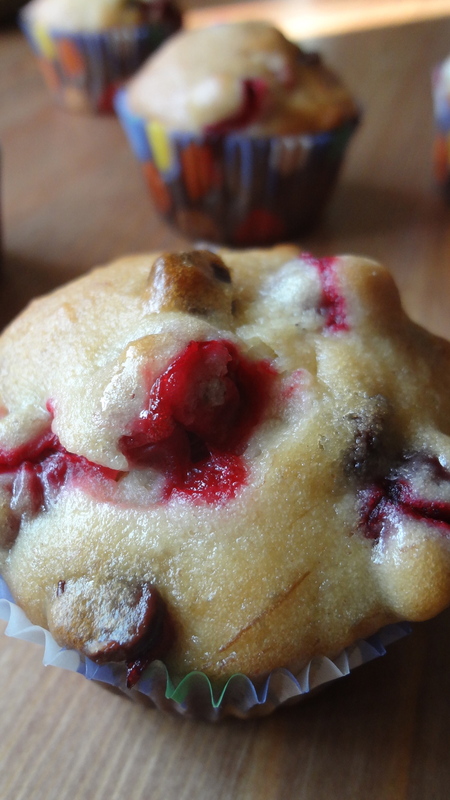 Bake for 15-20 minutes, or until a toothpick or cake tester inserted into the middle of a muffin comes out clean. Then cool on a wire rack until it’s time to eat! This entry was posted in Uncategorized and tagged Baking, Banana Bread, breads, Breakfast, Chocolate, Cranberries, Cranberry chocolate chip banana bread, cranberry chocolate chip banana muffins, Dessert, muffins, quick bread, snack by theculinarycapers. Bookmark the permalink. Aww, thanks mydearbakes! And thank you for reading!